Can I Afford to Take Time Off to Raise My Kids? As parents, we make numerous decisions. Generally, the moment a couple announces they are expecting a child, the questions start coming… Boy or girl? City vs. suburbs? Public vs. private school? And of course the big question: what to do about childcare? 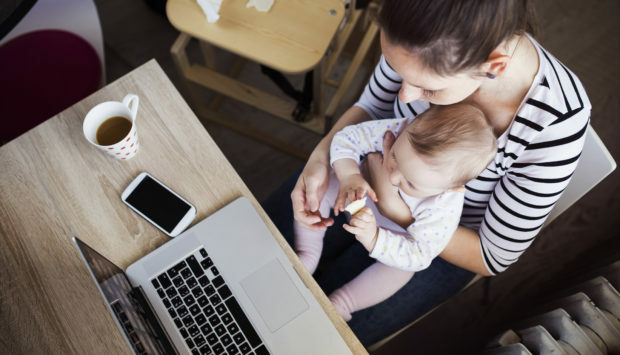 Given that the United States has no federal paid parental leave policy, many women must return to work when their baby is only weeks old, scraping together whatever leave or vacation time they can. Even those who are lucky enough to have several months of paid leave need to explore childcare options well in advance, as daycare centers sometimes have year-long wait lists. With the average cost of childcare as high as it is–in New York City, for example, it can cost over $20,000 per year for daycare and closer to $45,000 for a full-time nanny–it is no wonder that many families consider whether it may be more cost-effective for one parent to take time off from work to stay home with their children. Taking time off from work is not uncommon. In the United States, 40 percent of married mothers with a child under age 6 are not currently in the workforce. However, leaving the workforce has an impact from both an emotional and a financial point of view. For many parents, it is not always an easy shift to go from a successful career to being a baby’s full-time caregiver. Your vision of being home with an adorable sleeping newborn may be very different from the reality of the constant demands of feeding, bathing, and rocking a baby in a sleep-deprived haze. And while some connect very much with the baby stage, others feel the bond more as the baby grows into a toddler or preschooler, and can interact and communicate in new ways. This is usually the easier calculation to make. Consider your current savings as well as your income. Clearly someone with $1 million in savings is in better shape than someone who has a total of $10,000 sitting in their checking account. It is essential that in addition to your long-term savings (i.e. retirement and college), you have enough liquid funds available for any unexpected expenses. Many financial experts recommend 3-9 months of living expenses and suggest that a one-income family should aim to be on the higher end of the range. Next determine whether you could afford to live on one income and consider how stable that income is. It can be helpful to look at your last several years of spending to get a sense of your average. Annual credit card summaries are an easy way to do this. Do not forget to factor in any additional expenses that may result from one parent leaving their job. For example, if the parent planning to stay home currently receives free health insurance from their employer, and the other parent’s insurance plan will cost your family $1,000 a month, that can change the math a bit. A financial advisor can be very beneficial in running the numbers for you and helping to consider all the variables. Is it in my family’s best financial interest for me to stay home? This question is not as simple as there are so many variables to consider. It is essential when deciding whether to take time off from work to think not just about the calculation today, but also look a few years out. While the first few years can be extra expensive – with preschool costs sometimes layered on top of the cost of the nanny – it does get significantly cheaper once children are in full-day (public) school. If you know you will need to buy a bigger home in the next few years to accommodate a growing family, remember to factor that into your budget as well. The duration of time off from work can also make a difference. Of course, you will lose income for the years you are home with kids. But it can also be difficult to jump right back in and be at the same level, salary and otherwise. According to the Institute for Women’s Policy Research, a woman’s earnings generally take a 30 percent dive after she has left the workforce for two to three years. The impact will vary from field to field. Teachers, for example, may have their job held for three years and be guaranteed the same position upon return. Other industries may not be so accommodating. It can be helpful to stay engaged through consulting or part-time work, or even volunteer assignments. That decrease in earning power can have a dramatic long-term effect on your family’s finances. Will taking time off put me at financial risk in the long term? Before taking substantial time off from your job, evaluate not only your family’s current finances, but also your own long-term financial well-being. What would happen if your spouse died? Do you have sufficient life insurance to account for your reduced earning power? If you got divorced, would you have adequate assets for your retirement? If you have a prenuptial agreement in place, you may have waived your right to alimony or a share of the income that your spouse earned while you were married. Before making any decision, it is be a good idea to consult with a family law attorney to discuss what your rights would be in the event of divorce. You may want to enter into a post-nuptial agreement with your spouse to ensure that your decision to stay home full or part time wouldn’t hurt you if your marriage doesn’t work out at some point in the future. While no one likes to think about the possibility of divorce, it’s something that can happen to parents who least expect it, and it can dramatically alter your financial situation – especially if you’ve been out of the workforce for several years. How will my decision affect my partner and my marriage? You want to make sure both spouses are on the same page with respect to your family’s goals. Discuss with your partner how you will deal with money as a couple when only one of you is generating income in your bank account. You don’t want to end up in a situation where you have no money to spend on yourself and where your every expense is being scrutinized. Make sure that your partner is supportive of your decision. Taking time off might put more pressure on your partner to earn more money or stay in a job that they don’t like. On the other hand, it may be important to them for one of you to be home with the kids. The decision of whether to take time off can involve incredibly difficult tradeoffs. The monetary impact is important; however, it’s hard to quantify the benefits of spending more time with your children while they are young. Ultimately, whether to take time off to raise kids is a very personal decision and each family should do what works best for their needs. Some families are okay cutting back on spending or moving to a less expensive area to make it work. Other families may decide they need two incomes to maintain their standard of living and all the extra costs that come along with having kids. No financial model can account for all the intangibles that go into your decision making. So whether you are climbing the physical jungle gym with your child, or navigating the corporate jungle gym, here is to a happy and successful journey….